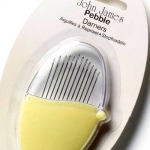 The John James Pebble "finest quality sewing needles in a Pebble" is a must have for every sewing box and handbag. It is easy to use and is a fabulous accessory and storage unit in one. This primrose lemon coloured pebble contains size 3 to size 9 darners, sewing needles with sharp points for mending and general repair. Contains 12 sewing needles.